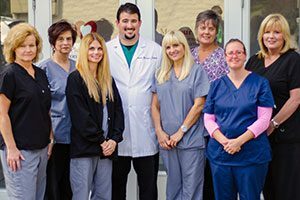 At Montour Dental, we are committed to providing every patient with his or her best smile. Even if you are missing some or all of your teeth, we can provide you with a comfortable, esthetic and functional appliance to restore your smile. We have a variety of options including traditional dentures and partials, metal free partials, and dentures and partials that can be anchored with implants. We work with a local lab here in Robinson Township to custom make every denture and partial to our patients’ specifications. There are no “Basic” or “Premium” dentures here – every patient gets our best work. If you are missing teeth or unhappy with your current denture or partial, please contact us to see what we can do for your smile.